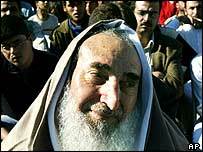 The killing of Sheikh Ahmed Yassin has ignited Palestinian fury across the Gaza Strip and West Bank. 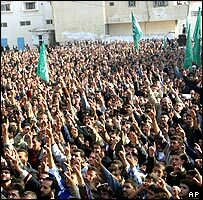 Tens of thousands thronged the streets of Gaza City carrying the sheikh's coffin draped in the green flag of militant group Hamas. The eyes of many burned with tears of rage as they chanted slogans like "death to Israel" and "death to America", the BBC's David Chazan reports. A number of officials of Yasser Arafat's Fatah movement marched with them. Militants in black balaclavas fired in the air. All appeared united in mourning for the founder of Hamas, the group which has been one of Israel's most intransigent enemies, adamantly rejecting any peace negotiations, our correspondent says. Thousands more took to the streets elsewhere in Gaza and the West Bank, in a spontaneous outpouring of grief and rage. Clashes broke out between the protesting Palestinians and Israeli troops, leaving at least four Palestinians dead, including an 11-year-old boy and a journalist. Several Israelis were injured in separate incidents and rockets are reported to have been fired at the main crossing between the Gaza Strip and Israel. 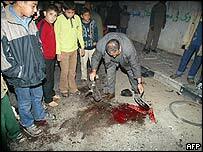 In Nablus in the West Bank, about 15,000 people flocked to the centre of the city after news of the killing. "A new intifada is born today," said a militant from Hamas' armed wing - the Ezzedin al-Qassam Brigades. "By Allah, we swear that the reprisals will come soon in the heart of Israel." Palestinians said a local journalist had been shot dead during a demonstration on the outskirts of Nablus. The Israeli army said Mohammed Abu Khalimi, a 22-year-old reporter for al-Najah University radio, was a Hamas militant and had been killed after opening fire at the troops. But residents denied he was a militant. Thousands more demonstrated in the town of Jenin. "The first reaction to this assassination will come from Jenin," said Zakaria al-Zubeidi, the local leader of al-Aqsa Martyrs' Brigades, an offshoot of Mr Arafat's Fatah. "This is the beginning of a new era. Sharon has started a new war against the Palestinian people and we are ready to fight him," Mr Zubeidi shouted through a loudspeaker. The Palestinians say the 11-year-old boy was shot dead by Israeli troops during a protest in the southern Gaza Strip town of Khan Younis. In Hebron, reports said dozens of Palestinians threw stones at Israeli soldiers, who fired tear gas. Palestinian sources said four men had been killed by Israeli troops. Yasser Arafat and the Palestinian Authority have condemned the killing of the man who founded Hamas and was seen as its main ideological guide. They declared three days of mourning in the Palestinian territories. The flag flew at half-mast outside Yasser Arafat's headquarters in Ramallah. Inside, the Palestinian leader and several of his ministers received mourners. In all Palestinian cities, shops and schools were closed, as mosque loudspeakers aired verses from the Koran. In the Israeli prison camp of Ketziot, hundreds of Palestinian prisoners rioted briefly, setting tents on fire and throwing stones at soldiers, the Associated Press said. Israel has completely sealed off the West Bank and Gaza Strip. In the city of Jaffa, a youth of Arab appearance got on a bus and began attacking passengers with a knife he pulled out of his pocket, police spokesman Gil Kleiman said. Earlier, another three Israelis were wounded by a Palestinian wielding an axe in the town of Ramat Gan, north of Tel Aviv. "Protests also came to Whitehall"